If anyone could take Downton Abbey, set it in a post-apocalyptic future, people it with invincible assassins, and make it work, it would be Greg Rucka and Michael Lark. And it definitely works. Lazarus is a new Image Comics series from Gotham Central (and etc.) 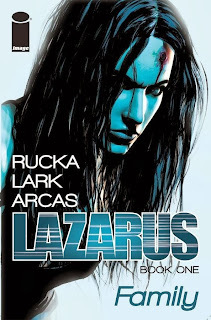 collaborators Rucka and Lark, which despite my Rucka fandom fell under my radar until Image recently released a value-priced collection of the first four issues, Lazarus Vol. 1: Family. Impressively, Rucka offers a complete story arc and introduces a fully-realized new world all in just this handful of issues, inadvertently putting to shame his fellow creators who need six issues to do what Rucka does in four. Rucka's Lazarus reminds me most of his Wonder Woman run. There is bloody violence here, but the most riveting parts of Lazarus are the calm yet fraught front- and backroom dealings, not dissimilar to Rucka's Olympian gods in Wonder Woman, dallying with the fates of mortals. Lazarus's triumph is to make the action on the battlefield just as gripping as that in the Family Carlyle's boardroom or in their kitchen. Entering a new fictional world is always difficult, and I would note that Rucka doesn't make getting in to Lazarus easy. The first two pages see the book's protagonist, Forever "Eve" Carlyle, shot to death in bloody fashion; the next seven see Eve, the Carlyle's Lazarus protector, rise up and murder them men who shot her. Thus it's not until the tenth page of the first issue that the reader really begins to be oriented in the story (and really more like the twelfth, halfway through the issue) -- that the world's territories are now broken into fiefdoms controlled by mob-esque families; that the families rule over a population of working "Serfs" and lower "Wastes"; and that each family is protected by a genetically enhanced, "super-powered" Lazarus. This is a difference, neither better nor worse, between Lazarus from Image and Brian K. Vaughan and Fiona Staples's Saga from Image. Saga, in the vein of Star Wars, narrates the terms of that series' interplanetary conflicts straightaway, while Lazarus lets the reader glean the details. For those on the fence about trying Image's offerings, I'd suggest that while both series are sci-fi, Saga is more sci-fi/fantasy while Lazarus is sci-fi/political. Saga has a significant amount of sexual content that turned off some readers; Lazarus is less adult in that manner, but considerably more violent, graphically so, than Saga is. The first issue of Lazarus sets out the terms of Eve's arc, at least for the near future. Eve is the family's assassin, but she's begun to have misgivings about killing, especially when she murdered a group of Wastes simply scrounging for extra food. There's also been a break-in at the Carlyles' grain repository, and Eve's "brother" Jonah threatens to put a group of employees to death unless the "inside man" reveals himself. An old man admits to the crime solely to save his own daughter and the others, and as Eve kills him, artist Lark makes it clear on her face she understands that power of a father's love. What Eve doesn't know yet is that Father Carlyle is not her father nor is Carlyle her family; no doubt as Eve's disillusionment grows, she'll begin to see the difference between how her family treats her and the sacrifices of their subjects. The second issue, however, is where Lazarus really grabbed me. Father Carlyle summons his children for a meeting; Eve, Jonah, Beth, Stephen attend, though Johanna -- the scheming sister who reminds me of Rucka's Veronica Cale -- does not. Each of the siblings has their own often-intersecting agendas, and these play out subtly in the libraries and kitchens, where anyone could be eavesdropping (like Downton Abbey, except with more killing). When Eve isn't fighting her way through an army of soldiers, Lazarus is deeply political, and it's an aesthetic that's irresistible. Rucka leaves plenty of mystery still to be revealed in future volumes. Eve is not of Carlyle, we know; there's a suggestion she might be Beth's daughter -- the daughter of her faux "sister" -- but even this might be misdirection. We still don't fully understand the make-up of these "families" -- Jonah is involved with Johanna, and either this is an incestuous relationship or these characters aren't siblings in the way we're meant to understand. Can Eve gain new powers, like telepathy? And who is the Carlyle family's mother? Having only read Rucka's DC Comics work so far, I hadn't expected the level of violence found in this book, nor had I ever seen Lark depict such before. The violence is extreme but not gratuitous, I don't think; Lark's sprays of blood are more exact and realistic than the cartoony spurts in Team 7 that I read recently, and if gore is to be used, I'd prefer an artist who seems to take it seriously over one that doesn't. Lark draws an exceptionally choreographed final sequence in issue #4 that overlays Eve fighting the renegade Jonah's soldiers with Jonah spying and hoping for Eve's downfall, Beth spying and rooting for Eve's success, and Johanna's henchman beating her to help her hide her role in the scheme, with each sequence touting a different color palette courtesy colorist Santi Arcas. It's an epic thirteen pages, and worth all the blood spatters within. Greg Rucka's Lazarus Vol. 1: Family ends with Eve receiving a hint that all isn't what it seems -- and again, artist Michael Lark sells the scene with the look on Eve's face. I don't usually go for dystopian cyberpunk-type stories, but Rucka and Lark give this one so much depth, I'm hooked. Lazarus was a pleasant surprise for me, and if you check it out I don't think you'll be disappointed. Later this week ... Green Lantern Vol. 3: The End(!). Greg Rucka is the best. He's my favourite writer not only in comics, but in novels also. I only read the first issue yet, but can't wait for the trade to read the whole first arc. I finished it yesterday and I'm very pleased with this book. Normally I am not a big fan of storylines focussing on schemes and complots within a (wealthy) family. But it is very well executed here with a lot of cool scenes involving Eve, and a lot of interesting worldbuilding. And of course, the art by Michael Lark is absolutely fantastic. Fans of Gotham Central, or other previous work of the creators, should definetely check this out. My only complaint is that it is relatively short, containing only four issues. 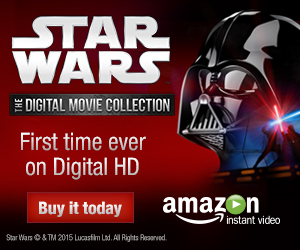 But it was accordingly low priced, so that's okay, too. Thanks for covering this - I expect I would have missed if if you hadn't... Very good indeed - highly recommended!